Copy received in return for an honest review. Oathkeeper is set in a small town in Colorado where a returning vet becomes an unexpected hero by stopping a mall shooting. But events rapidly go downhill from there, as a botched DEA raid starts a chain of catastrophic events. Although the vet walks onto the setting as a hero, he is more of a Greek tragic figure, and the story actually revolves around the town sheriff, Chief Bear Ellison. Sheriff Ellison is the everyday citizen who is faced with the moral dilemma of Law Enforcement today - what do you do when the enforcement collides with the Constitution? This is the most libertarian book I have read in some time. It's very much against the War on Drugs, a position I have mixed feelings on. The story builds up to a confrontation between Federal authority (in the form of the DEA) and the residents of a small town. This is also very topical, considering recent events in Oregon arising from the Hammond case, or less-known botched DEA raids. 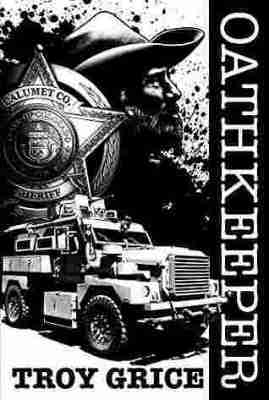 In terms of story, Oathkeepers is very readable once the action gets going. I thought there was some drag early on when introducing some characters, but events move quickly after that. The resolution is maddening yet inevitable, and the ending is open to sequels, though I have no idea if the author has any planned. Oathkeepers is a thought-provoking book that will spur thoughtful discussion in any book club or group.